At the age of 10, when the Dukes of Hazard TV series first aired, I knew that I would own a ’69 Charger! At the ripe ol’ age of 15, with lots of work, saving every penny, I finally found my Charger in 1984. I had no clue that it was a real 440 4-speed, Super Trac Pac R/T and was originally A4 silver! But I didn’t care then!~ I almost painted it orange with “01” on the doors! Many years later, with lots of burn outs, dirt roads and three motors, this is the same car! 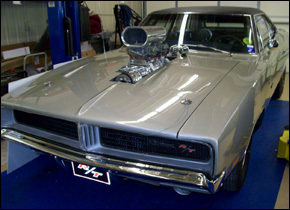 The motor is an all aluminum 572ci Hemi that makes over 1,000hp on 5 lbs. of boost and pump gas. It still has the original console 4-speed shifter hooked to a Jerico transmission, 4.10 Dana 60, weighs over 4,000 lbs. and has gone 9.51 at 149 mph through mufflers and DOT tires! P.S. I did eventually own a ‘real’ Dukes stunt car, featured in the ’05 Dukes of Hazard movie–the only matching numbers, complete running-and-driving drift car! It was a blast and it is greatly missed!! Growing up, I was always surrounded by cars! 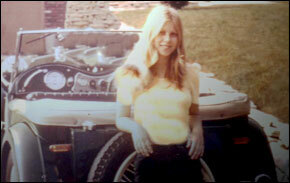 My Dad was into old Jags and my brothers, of course…muscle cars! 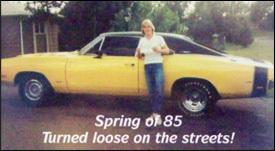 It was the ’70s and in the summertime, it was a cornucopia of cool muscle cars everywhere! Tires could never be too big or rear ends jacked up too high, pipes too loud or impact colors too bright for Mopars. There could never be too many billboards with call outs, drag races at the lights and many cool Harley choppers. Panheads were cool…they still are! I thought those days would never end. I always had fun cars and 4-speeds. If I was standing in the garage, I was given a job to do. I remember asking my dad to drive one of the Jags to school and he handed me the keys to his ’60s Dodge Van – 3 on the tree, instead. Is that what started this Mopar fever? I also remember the girls wanting to date the guy with the “cool” car. Well, I wanted the “Cool Car!” They were crazy times. I sang in several bands through the ’70s and ’80s. There was always a rock concert to go to, and yes, I watched the Dukes of Hazard too! What better teenage memories than ROCK N’ ROLL and MOPARS?! Then I met my husband, Troy. We share the Mopar passion. We both had our car collections and that brought us together. We had just one problem…between the two of us, we needed a way BIGGER garage!!! Visit The R/T Garage Website for more info.